Homemade Chicago Dog Relish | Good. Food. Stories. Pity the vegetarian in Chicago. Not only are the meat-averse missing out on the city’s many classic steakhouses and top-notch butcher-driven restaurants like The Publican and Girl and the Goat, but they’re depriving themselves of one of the city’s greatest—and lavishly veggie-topped—meaty treats: the Chicago dog. I’m embarrassed to admit that when I lived in Chicago, that vegetarian was me. For the uninitiated, a Chicago dog is a hot dog (typically an all-beef Vienna frank) topped with a pile of pungent garnishes: mustard, onions, tomatoes, dill pickles, sport peppers, and glowing green relish. It’s traditionally sprinkled with celery salt as the final add-on and served on a poppy seed bun. No, ketchup is not part of the equation. The history of the Chicago dog also serves as a culinary shout-out to all the immigrant groups (Italian, German, Jewish, Greek) that made their way to the Windy City over the years. And unlike some of the more outré mashups we’ve been subjected to in recent years (donut burgers and ramen burgers, I’m giving you the side-eye), this one works spectacularly. The spicy, tangy blend of pickles and peppers is balanced by the sweet tomatoes and punched up by hints of celery and poppy seed, and all the elements cut through the rich, salty fattiness of the beefy hot dog. Since my return to the world of carnivores, I’ve happily wolfed down innumerable Chicago dogs at Cubs games, at stands throughout the city, and in my own backyard. Here’s the thing, though, and I hope I can say this with all honesty as an adopted Chicagoan—they’re a mess. And I get that that’s part of the Chi dog charm. 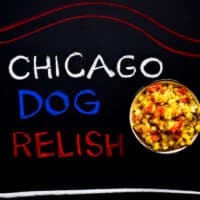 But since I’m safely in residence on the East Coast, where I can do things like play with the Chicago dog status quo, I’m going to make things a little easier on myself and chop up a bunch of ingeniously homemade Chicago dog relish. 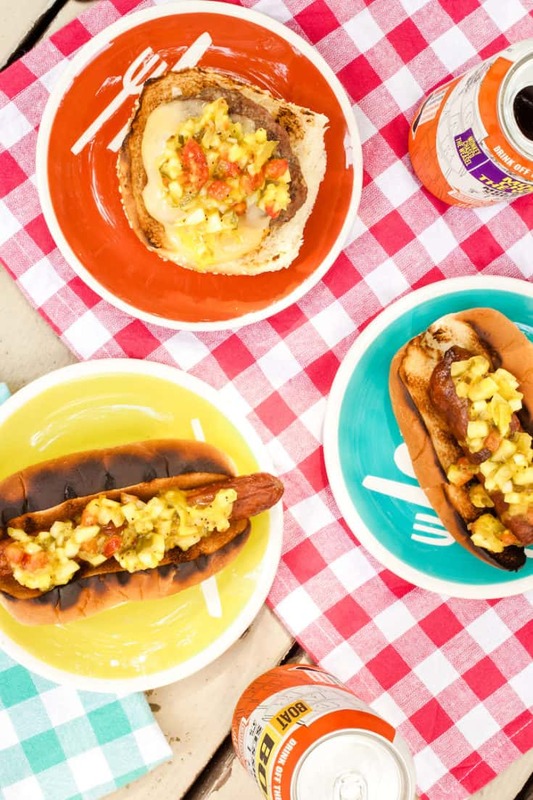 Make this salsa-like mix incorporating every single one of the traditional dog toppings and leave it in your fridge for spooning on your favorite brand of hot dog—or brats, or kielbasa, or burgers, or even (gasp!) grilled chicken. It’s instant gratification for the Chicago dog cravers among us. Both sport peppers and that crazy neon green relish are available online if they’re not stocked at your local supermarket, but if you don’t feel like hunting them down, you can substitute whole pepperoncini and sweet relish, respectively. Bonus: your relish won’t look like a nuclear meltdown. And though you could use a food processor to chop everything up at once, I like the chunky texture that comes from dicing the pickles, tomatoes, onions, and peppers by hand. 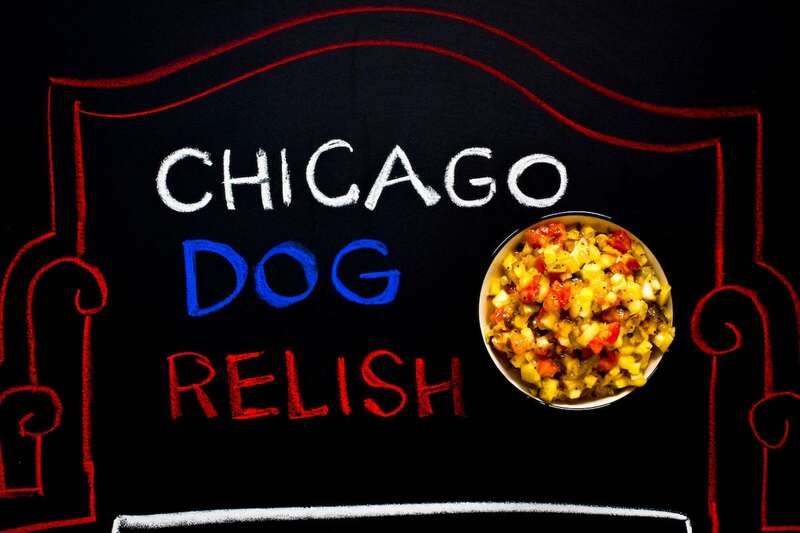 Homemade Chicago dog relish mixes pickles, mustard, onions, peppers, relish, celery salt, and poppy seeds for a classic Chicago taste in one spoonful. Chop the tomato, onion, sport peppers, and dill pickles into a fine dice (about 1/8 inch). Stir the chopped veggies together with the relish, mustard, poppy seeds, and celery salt in a medium bowl. Taste and add salt if necessary (though highly unlikely). Store the relish in an airtight container in the refrigerator; it will keep for up to 1 month.